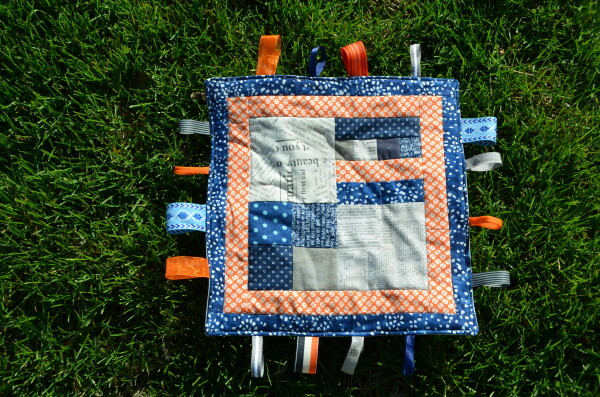 It seems like the only quilting I get around to doing lately is making baby quilts for people. I don’t mind that at all, but I have been seriously slacking in the amount of time I put into my sewing projects lately. That’s why I’m glad that my sister requested a make a baby quilt for one of her friends. It gave me a project with a hard deadline, so I *had* to go sew. I don’t normally do “commissioned” quilts, but since it was a small project and my sister asking, I gave it a go. The only restrictions I had for this project were the color palette for the baby’s room, which is navy and gray with pops of orange. It was a fun modern palette to work with. 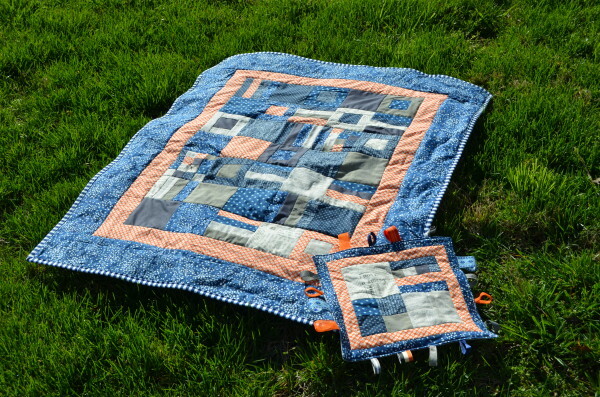 I decided to go with another Squares and Strips quilt, because it’s such an easy pattern, that seems to give me great results. (See the others here, here, and here.) The only difference, was that this time, I cut my block size in half – making the blocks finish at 4-inches. I think it ended up being a good choice for a baby quilt. For this quilt, I was able to pull all of the fabrics, except for the backing from my stash. 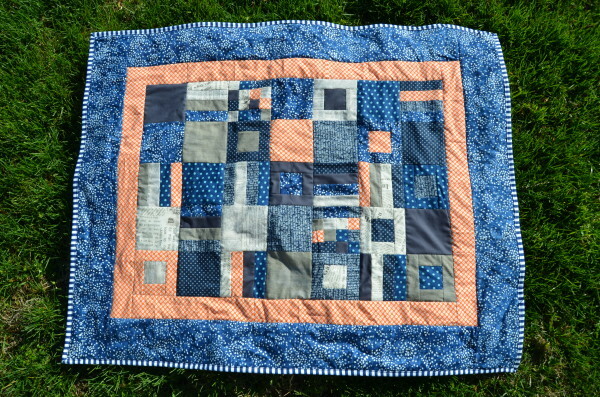 I used a total of 9 different fabrics for this quilt: 4 gray, 4 navy, and 1 orange. Cutting the same number of pieces that I would have had I been making the larger blocks, I had 38 blocks; enough to make a 5×7 grid (with a few to spare). That gave me a 20×28-inch pieced center. From there, I added 2 borders, bringing the total size of the quilt to 32×40-inches. 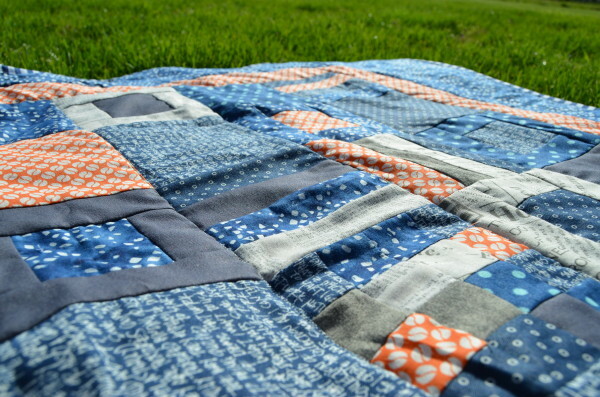 I backed the quilt in a light grey dot, and bound it in a navy and white stripe. Then I took my scraps, and some of my ribbon collection and made a matching taggie blanket to go with it. 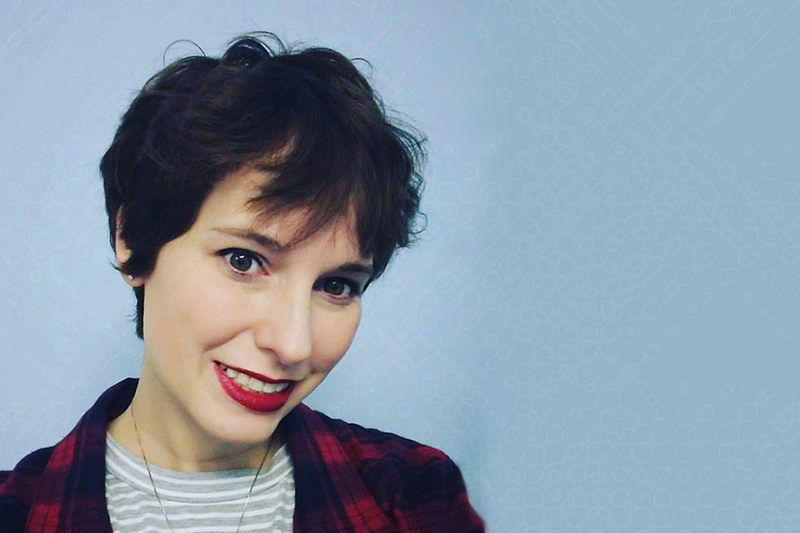 ← Previous Previous post: Bookish Questions – An author that you dislike/hate? Well done you! The “taggie blanket” is a new idea for me. I know you’ve mentioned them before. I just finished binding the baby quilt I’m making for Lydia. Baby Daniela was born by C-section at just a week under 7 mos, last Monday. She’s still in the incubator. It’s funny, usually I love the quilt until I’m about halfway through the handquilting process, and I start to be sick of the sight of it. This time, it was the other way round. I really don’t like the colours and patterns Lydia favours, so it was hard to make this one…but now that it’s done it looks pretty good! Of course it will be a surprise for her. I don’t know how to imbed an image here, so maybe I’ll email you some pics later. That would be lovely. I’m so glad you got the quilt done.